"I shall CRUSH humanity and lay eggs in your hollow skulls!" 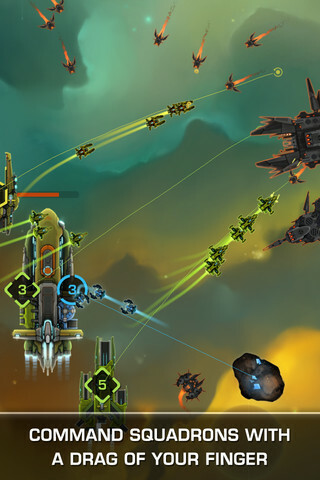 'An RTS-lite with pretensions of Homeworld' may not sound like the most flattering description of a game, but the fact is I'm having a blast with Strikefleet Omega. As with the classic PC game, humanity is under a dire assault in space and so you need to take charge of a fleet of starships in order to ensure that the Mothership, I'm sorry, Command Ship isn't completely obliterated by the assaulting army, prematurely ending each mission. These enemies come in a variety of flavors and they swarm from all corners of the screen. Arrows warn you when a group is about to approach and so you use your finger to swipe your different units towards them. On arrival, your army auto-attack these gathering swarms of destruction, although certain ships and artillery weapons are better suited for specific enemies. Your static heavy artillery units, for example, are essential for taking down the larger fiends, while your nimble interceptors are better at dispatching the worker drone swarms. It's not nearly as tricky to control your units as this screenshots might suggest. 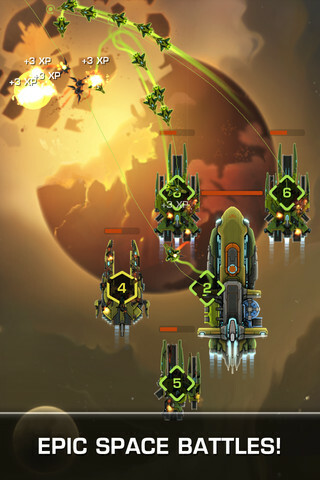 A layer of strategy is introduced by the mining barges you can warp in to the battlefield. Each ship launcher or defensive module that you choose to warp in comes with a certain mineral cost, and while your initial mining drones do an OK job of harvesting new minerals, you'll want to whisk in (and protect) a mining barge pretty quickly for when the action really heats up. 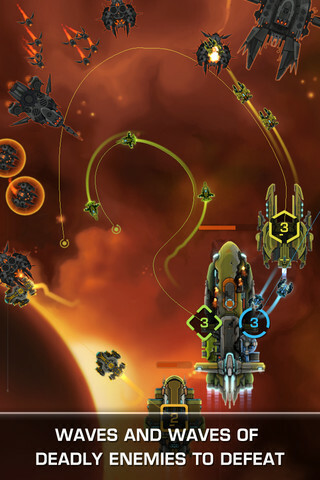 The game's difficulty curve certainly goes into over-drive around the 9th level, and you'll realize then that there is almost always a single strategy for success in each mission: in one situation, you might need that mining barge as your first upgrade, because a heavy infantry assault in two minutes' time can't be survived without two artillery-shelling units. The waves are fixed and predictable, and a second attempt is usually enough to ensure victory. The bigger the ships, the heavier your artillery capabilities will need to be. You might also find yourself eyeing up the in-app purchase store as the difficulty increases, so let's take a moment to outline what's available. The base currency of Alloy is used to upgrade and acquire the most basic ships. Special ships on the other hand require both Alloy and MegaCreds which are only rarely dropped by special enemies on the battlefield. This is only very gently impedes on the natural game progression, although The Tesla Class Advanced PPC Gunship, available for 100 MegaCreds (just shy of $4.99 in Earth money) seems like something of an "I win" button with its devastating cannon damage. Once you've conquered the 10th mission, you can participate in the Survival mode which (as the name suggests) requires you to survive an increasingly violent onslaught that's heavy on the micro-management. This is the one area of the game that perhaps leans a little too heavily on in-app purchases, as you'll be given none of the freebie perks (offensive and defensive modifiers) available during the campaign. Still it's a fraught and fantastic mode in its own right, and if you ignore the leaderboards where money will inevitably dominate, then you'll find it very satisfying indeed. Survival mode is an endless onslaught of enemies. The complete absence of music may strike you as a negative or positive thing: it's a question of taste, I suppose. Personally, I quite liked the thudding booms of the artillery explosions which have a greater grimness when left to echo uninterrupted, and nothing would have been worse (or perhaps more tempting) than to slap an off-the-shelf chiptune over the action. Strikefleet Omega invokes some very happy memories of one of PC gaming's greatest triumphs, Homeworld. While this is a far more arcade-like, simplistic and brisk version of that classic RPS, we've given up hope on a third installment of the game ever seeing the light of day, and so this is just what we need to keep us occupied on the way to work in the mornings. What's Hot: Plenty of upgrades and a very accomplished game in a neglected genre. What's Not: Minimal audio and some over-powered upgrades for real cash.